On 14 January 2016, EARTO organised an event launch its new publication on “Economic Footprint Study: Impact of 9 European RTOs in 2014”. 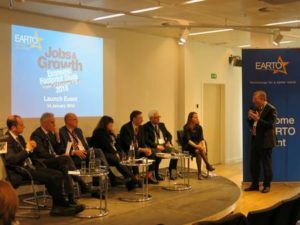 This was the occasion for EARTO members to discuss and debate on the Impact of RTOs and R&I Investments with around 90 EU Institutions representatives and other R&I stakeholders. The study, commissioned to IDEA Consult, highlights the economic footprint of RTOs based on data collected from 9 RTOs, representing 1/3 of EARTO members in terms of employees and turnover: CEA, DTI, Fraunhofer, imec, SINTEF, SP Technical Research Institute of Sweden, Tecnalia, TNO, and VTT Technical Research Centre of Finland. €5,2 billion fiscal and parafiscal returns towards governments. The study also showed that for each job created in those RTOs, 3 jobs were created elsewhere in the European economy in 2014 and for each €1 invested in these RTOs in the form of basic grants, €3,8 returns flew back to governments.